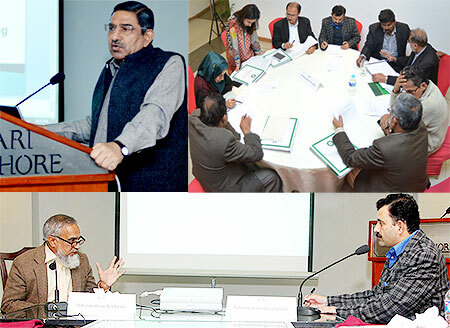 January 12: A one-day Training Session for Public Information Officers (PIOs) appointed under the Punjab Transparency and Right to Information Act 2013 was held by the Punjab Information Commission (PIC) in Lahore. This was the third training session held by the PIC in collaboration with PILDAT to sensitize PIOs on the Effective Use of the Punjab Transparency and Right to Information Act, 2013. The training included an in-depth overview on Concepts and Principles of the Right to Information, which wasled by Mr. Ahmad Raza Tahir, Information Commissioner, PIC. Mr. Ahmad Mubarik, former Police Service Pakistan Officer, briefed the participants on Role of Public Information Officers: Procedures for Handling Requests. The training ended with a group simulation exercise in which participants enacted the roles of Public Information Officers and Information Seekers in scenarios designed to test their knowledge of the Act. Mr. Mazhar Hussain Minhas, Chief Information Commissioner, PIC, distributed certificates to participants upon conclusion of the Training Session. During their training, participants engaged in lively discussion and put forward a number of suggestions for the consideration of the Punjab Information Commission. Chaudhry Muhammad Ashraf, District Officer, City District Government, Multan, called for the designation and training of PIOs at District and Union Council level to ensure success of the Local Government system. Mr. Jamal Farid, Tehsil Municipal Administration, Rajanpur, was of the view that widespread public use of RTI must be promoted through grassroots awareness campaigns. Dr. Saeed Aamir, Assistant Medical Superintendent, Pervaiz Ilahi Institute of Cardiology, Multan, discussed the possible conflicts of interest that may come into play with the release of sensitive information about personal assets of government officials. At the end of the Session, Ms. Nadia Zia, Deputy District Officer, DCO Muzaffargarh, felt that she now had a clear idea of her role and powers as a PIO under Punjab’s RTI law. Over 20 officials attended the Training from the districts of Lahore, Multan, Muzaffargarh and Rajanpur. They represented a number of government departments, including Agriculture, Buildings, Communication & Works, Cooperatives, Environment, Local Government, Police, Population, Tehsil Municipal Administration, Waste Management, and Water & Sanitation. The Training of Public Information Officers (PIOs) on the Effective Use Punjab Transparency and Right to Information Act 2013 was facilitated by PILDAT under the More effective Right-To-Information (RTI) at Federal and Provincial level (Sindh and Punjab) Project, for which PILDAT has received financial support from Development Alternative Inc. (DAI) under the Enhanced Democratic Accountability and Civic Engagement (EDACE) Project.